The Smell of Rain: before, during, and after. Have you ever walked outside and been able to smell an approaching rain storm? You probably weren’t just imagining it. There are scientifically identifiable scents that come before, during, and after rain. Some of these beautiful and evocative smells even have their own names. The first smell to arrive, before the storm has hit, is ozone. Molecules containing oxygen are split apart by the storm’s lightning, and the individual oxygen atoms recombine to form ozone (O3). This ozone is carried down to the ground by vertical winds (the ‘down-draft’) and pushed ahead of the storm. Ozone has a sharp smell, similar to chlorine. I just took a break from writing this article to go outside with dcrock and check out a passing storm – sure enough we got a blast of sweet, sweet ozone! The colors indicate the amount of rain (or raindrop-sized things) reflecting the radar signal. The storm is at the top in red, and the cold air is spreading out ahead of it as a ‘gust front’. The front, which is mostly dry, is detected by the radar because it concentrates a lot of dust and bugs! Here is an animated version. 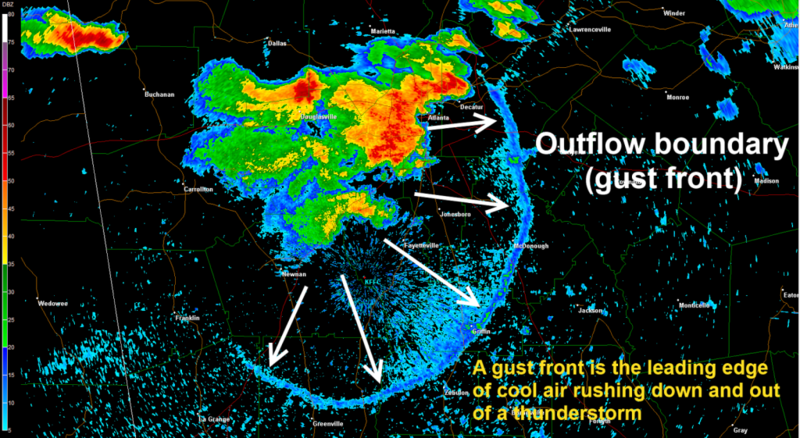 It’s this gust front that carries the fresh-smelling ozone ahead of the rain storm. “Petrichor” – written in the stone. The smell during rain is more geological in nature. Rain on hot concrete is a particularly vivid smell for me, and it has to do with raindrops liberating organic molecules from the grooves and pore spaces in the rock. The same smell can come from all sorts of other rocks and from decaying organic matter exposed to the rain. This smell has been named ‘Petrichor’, a word deriving from the Greek ‘petri’ (stone) and ‘ichor’ (divine blood). The word was coined by two Australian scientists, Bear and Thomas, in a very interesting paper from 1964. They set out to determine the origin of this lovely stench by studying rocks from all around Victoria. Having collected a variety of rocks that exhibit the smell (including volcanic scoria, bauxite, and kaolinized granite, for those of you who get off on that kind of thing), they heated the samples to 600°C in a furnace in order to remove any trace chemicals. By design, the rocks at this point had no scent, with or without water. But after leaving the rocks exposed to dry air for many months, they found that the rocks then gave off the petrichor smell when wet! Clearly the origin of the smell was coming from the air itself, biological contamination having been ruled out. Bear and Thomas concluded that petrichor originates from substances in the atmosphere (mostly organic) that accumulate in the pore spaces of the rocks. After isolating the petrichor as a yellowish oil, chemical analysis revealed that its composition was remarkably consistent across all samples. They found that it included: elemental sulphur (from hydrogen sulphide in the air), cyclic bases such as pyridine and quinoline, nitrophenols, carboxylic acid, and other miscellaneous hydrocarbons. In a follow up study, Bear and Thomas studied the effect of petrichor on the germination of seeds. Applying minute amounts of the oil to seeds from cress, mustard, and various grasses, they found that the seeds took a significantly longer time to germinate. So it would appear that plants release petrichor as a way of preventing their seeds from germinating during unfavourably dry conditions. When it rains, the petrichor blanket is lifted, and the seeds can begin their lives in healthy, wet weather. Geosmin, the scent of the Earth. Walking through a damp forest after rain has a very unique smell. This one comes from bacteria in the soil, and is known as ‘geosmin’ (literally “Earth smell”). Studies have identified geosmin as one of the metabolic by-products of a class of bacteria known as Actinobacteria. Geosmin is responsible for many earthy tastes in alcohols and foods such as fish and vegetables. Why this smell is released during rain is unclear. It has been hypothesised that, by signalling the presence of water, the smell is a method of attracting thirsty animals which unknowingly help disperse the bacterial spores. Sneaky. I have to acknowledge that this article exists. It’s a great article, but I like mine more. Follow-up paper from Bear and Thomas. Haha, yes! Well let me know if you manage to get a non-poisonous ozone perfume. I would wear that. In researching my article I came across the fragrance brand Demeter, who have made a few perfumes that mimic rain smells. There is ‘Thunderstorm’, for example, which doesn’t actually use ozone. And ‘Dirt’, which uses geosmin (that by-product of bacteria in the soil after rain) as an ingredient. I feel kind of ignorant for never wondering about the smell of a storm before – it’s such a distinctive smell, but the fact that water doesn’t smell but a storm does never seemed weird until now! This is a fascinating explenation of it all: it’s remarkable to think of all those tiny organisms generating the ‘smell of storm’ for their own selfish purposes. I love that smell all the more for having read your post! The smell of rain signals fresh water, so it makes sense that animals would be attracted to the smell and seek it out. This would be especially useful for animals living in dry environments, as humans did for much their evolutionary history. An article that I linked to in my post observes that camels in the desert can locate oases up to 50 miles away, probably by detecting trace amounts of ‘geosmin’ in the wind. Other animals can also do this, to varying extents. As I mentioned in the post, the geosmin smell may have evolved in actinobacteria in order to attract thirsty animals which help disperse the bacterial spores. The animal sense of smell probably evolved simultaneously to be able to detect geosmin. It might be a kind of symbiosis. To answer your question directly, there may be no real evidence for why the smell is attractive. As with many evolutionary questions, sometimes the best we can do is come up with scenarios that are logical and consistent with everything else that we know. Wow, this was a great blog to read. I hate chemistry with a passion but this made it seem so interesting! I especially liked the beginning about the ozone smell and it was so interesting when you mentioned the petricher that plants use. Is there any evolutionary evidence that may explain why people may love the smell of rain?